The perfect armchair sailing guide, with enough detail to set a person dreaming . 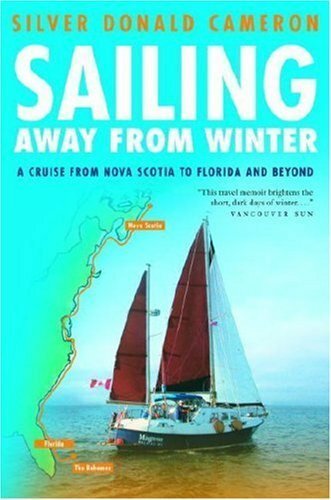 . .
On July 21, 2004, Silver Donald Cameron and his wife, Marjorie Simmins, set sail from D’Escousse, in Cape Breton Island, toward the white sand beaches and palm trees of the nearest tropical islands. They were sailing an old Norwegian-built ketch named Magnus. Accompanying them was their dog, Leo the Wonder Whippet. Leo was thirteen. The skipper was an old-age pensioner. His youthful mate was new to the cruising life. Yet 236 days later, with more than 3,000 nautical miles behind them, this distinctly trepid crew rowed ashore in Little Harbour, in the Bahamas, heading for Pete’s Pub, a palm-thatched tiki bar on the beach. It had been quite a trip. All three had lost fat and gained muscle. They were not in debt. Friends had remarked that the skipper and mate looked ten years younger, and the ancient Leo was capering about like a puppy. Mind you, there had been bad moments, as in Jonesport, Maine, when the skipper smashed the boat into a wharf and punched a hole in the bow, or the black night off the deadly coast of New Jersey, in a screeching gale with the boat rolling her side decks under. But there had been plenty of thrills, too: fireworks over the Tall Ships in Halifax Harbour; careening down the East River at ten knots with Manhattan whizzing past to starboard; feasting on hush puppies and grits with chicken gravy in Georgia; enjoying the ancient streets of St. Augustine, and the dazzling opulence of Fort Lauderdale. And then, after crossing the Gulf Stream, the Bahamas, complete with coral reefs crowded with tropical fish, yellow and scarlet and black. A long way from the snow and ice back home.